Donald makes the mistake of heckling Mickey's magic act, so Mickey gets his revenge ... or so he thinks. 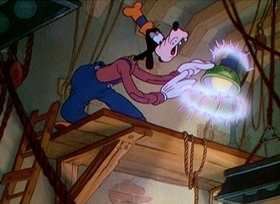 Goofy getting electrocuted when he sticks his finger in a live light socket. 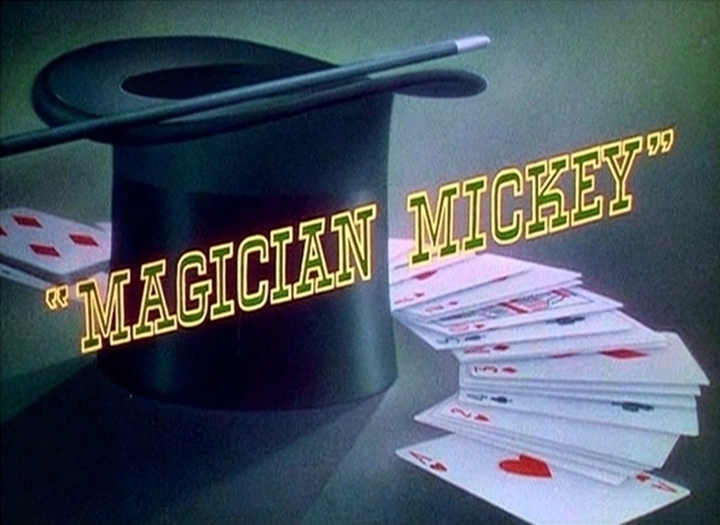 Come Divertirsti Con Paperino & C.
This short features a confrontation between Mickey the Magician and Donald the heckler. 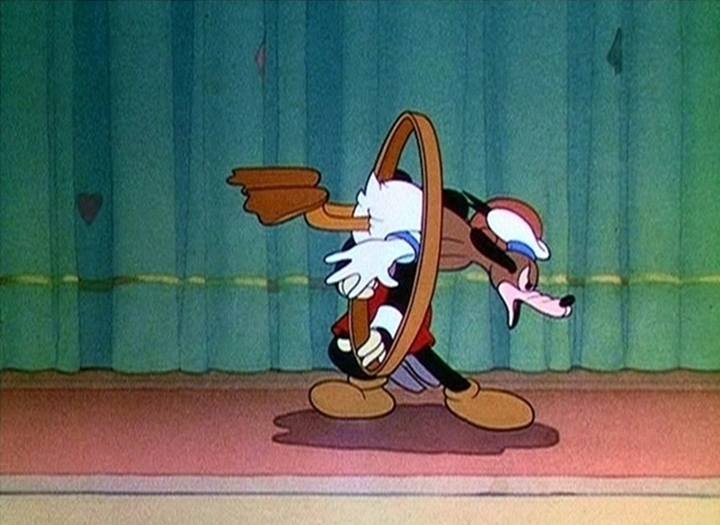 The tricks Mickey plays on Donald are a series of very clever sight gags. 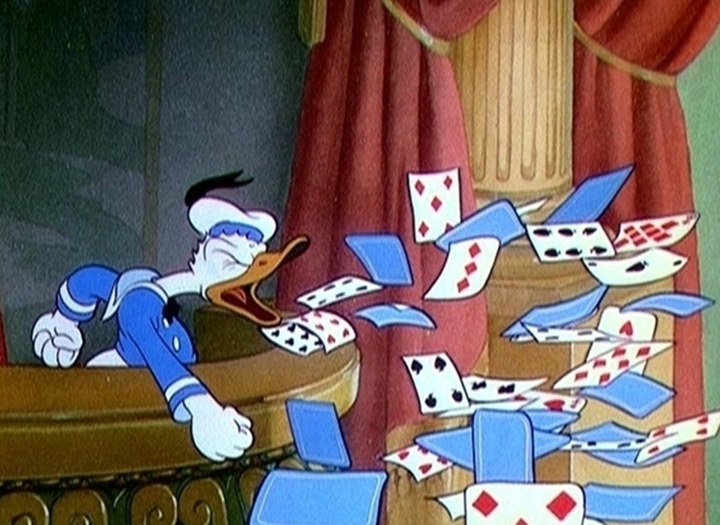 (I like Donald transformed into a deck of cards best.) 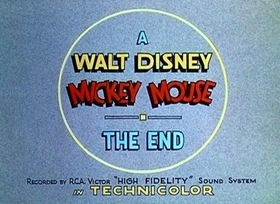 Mickey in his classic form, a bit cruel to Donald, and the non-stop action make this one of the great color Mickey shorts. 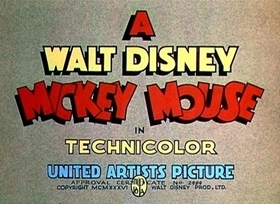 The Mouse tended to become very bland after about 1935, but he's in top form here. I wish they'd make some new shorts with him in classic form. Loved the conflict between Mickey and Donald. Donald continually heckles Mickey's magic act, but Mickey bests him at every turn. 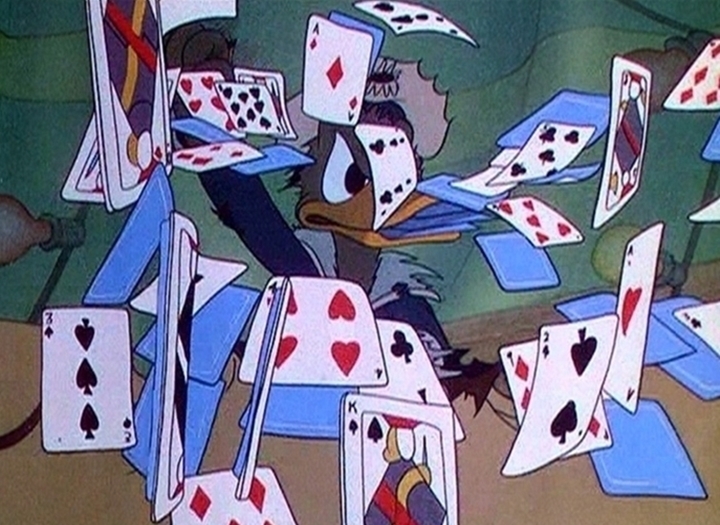 I especially enjoyed the ending of the cards still coming out of Donald's mouth. Fun and full of gags - I still enjoy this after watching it hundreds of times over the years. This would have to be my all time favorite short. I've had it taped ever since I was a child. 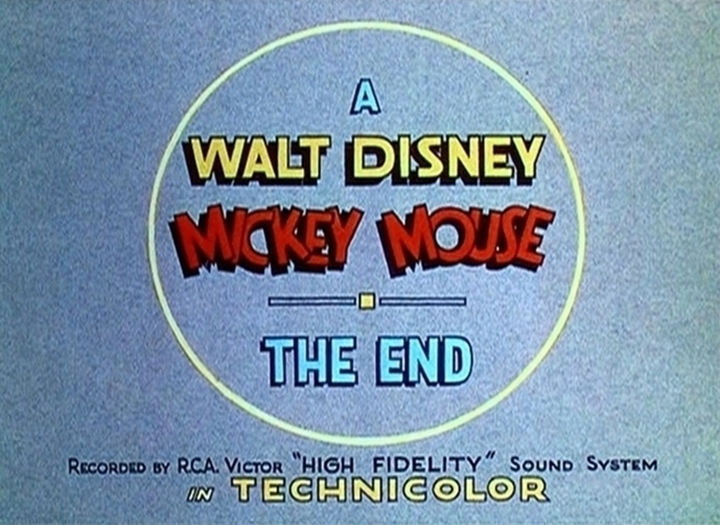 Although Mickey doesn't say a whole lot his act is just hysterical. Poor Donald just doesn't know when to stop. The best part is still all the cards coming out of Donald's mouth. It happens around 5 times but it still cracks me up. I'm a big Donald Duck fan and this is definitely one of my favorites, although as usual, he doesn't exactly win in the end. It's great to see Mickey not being too goody-two-shoes in this one and playing tricks right back at Donald. I own this now on the Walt Disney Treasures DVD, which includes the cut scene of Goofy being electrocuted. Before buying it, it had been ten years at least since I'd seen it and I've wondered, what's with that 'X' on the floor? 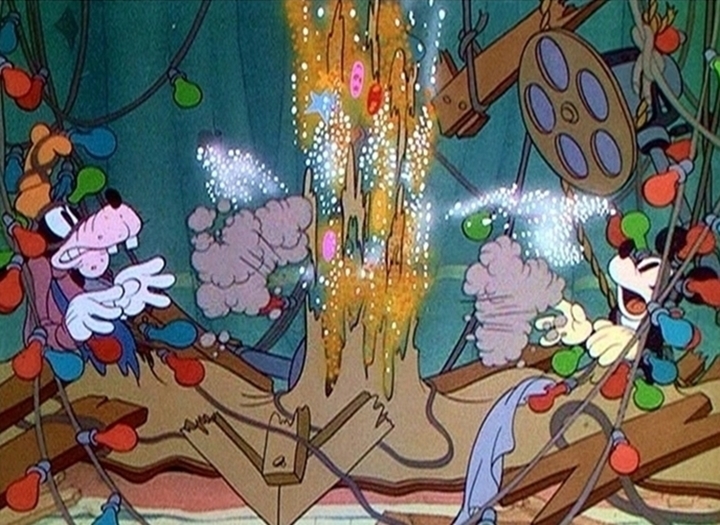 I thought I might have remembered a bunch of stuff falling on Donald there but I'm not sure. Anyway, I love this short! A pretty hilarious, unbelievable and competition cartoon on Mickey and Donald. 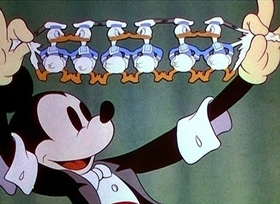 Even though Donald starts to laugh on one of Mickey's magic tricks like transforming the cape into a black bird, it was funny when Mickey uses his wand to actually squirt water on Donald's face and the egg trick. 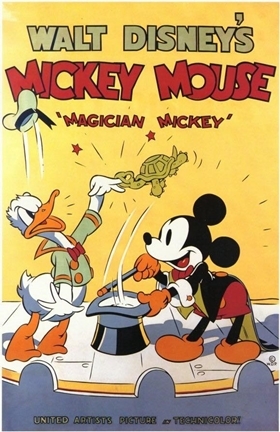 This is one of my favorite Mickey Cartoons. I enjoyed the music as well and several other scenes such as Donald changing into all sorts of creatures. I have 2 favorite parts in this short. 1. When Donald used Mickey's wand to make a ice cream cone with raspberry and the ice cream automagically went into Donald's face. 2. And a lot of playing cards coming out of Donald's mouth. Donald didn't like Mickey's magic show so he did his Donald tantrum. 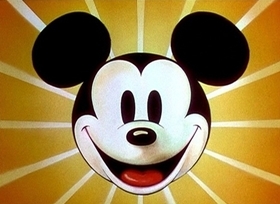 I loved this Mickey Mouse cartoon. I give it a 90. I imagine this as some sort of television sitcom in the future with audience laughing. 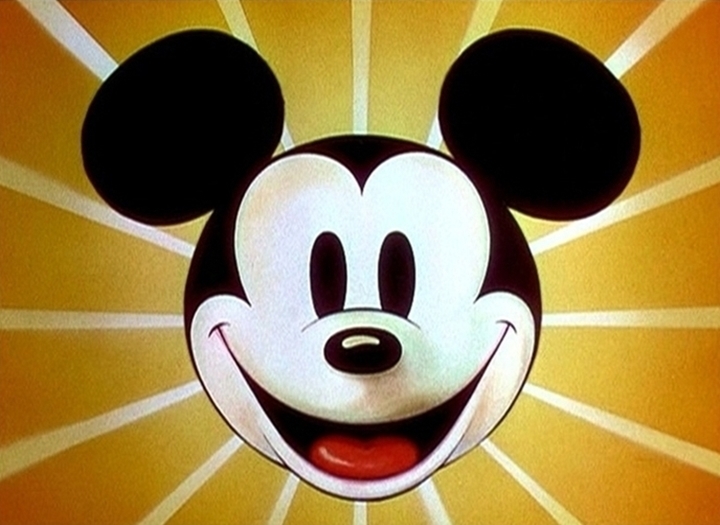 1937 is shaping up to be a fantastic year for Disney animation, if the first few shorts are any indication. First we had The Worm Turns, one of my personal favorites, then there was Don Donald, the first solo Donald short. Now, we get Magician Mickey, another favorite of mine and a great example of Mickey reverting back to his former, mischievous self. 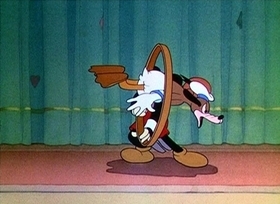 Mickey in this short plays as the foil to Donald, which is not a role we’ve seen before, except in another classic – The Band Concert. The difference between that classic and this one is that Mickey is on the offensive. 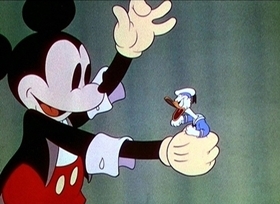 Magician Mickey shows Mickey at his most confrontational, something that has been missing from his shorts for over a year. As expected, the short is about Mickey coming on stage to perform a magic act. 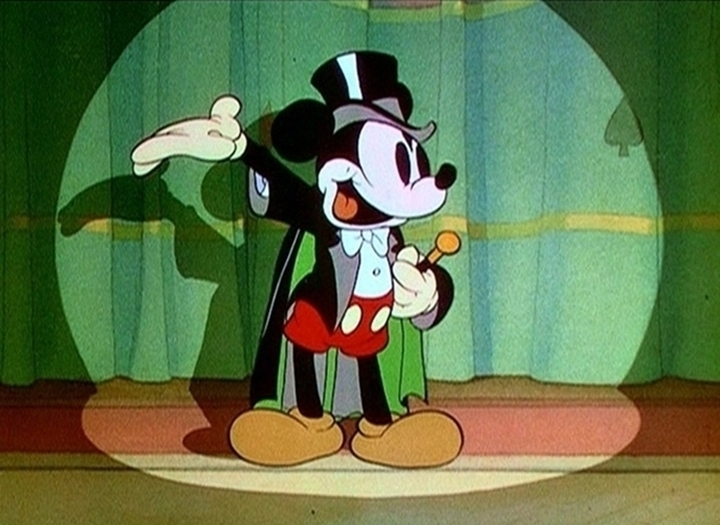 It’s another in a series of shorts that shows Mickey performing in an opera house/stage setting. Walt’s love of vaudeville and live theatre comes across when you see the shorts, because his characters are so often putting on a show. It’s not the most imaginative use of the medium, but it works well because of the gags the animators pull off. Donald begins heckling Mickey almost from the word go. 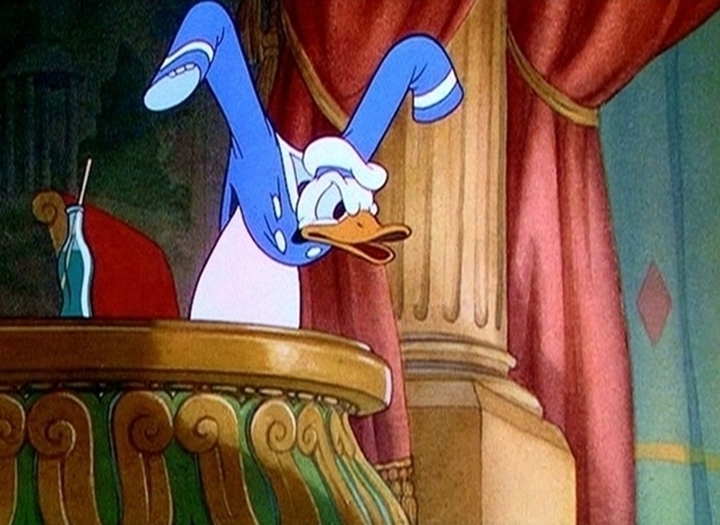 It’s probably some form of payback in Donald’s mind, since he was heckled by the orphans in other Mickey shorts, when trying to perform. Mickey, however, does not take kindly to it, and starts retaliating. 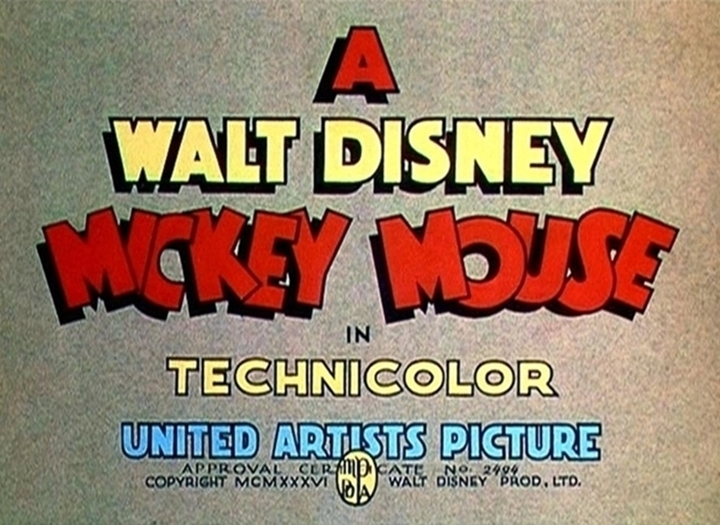 The short evolves into a back and forth between the two, with Mickey’s magic tools providing the impetus for some classic gags. 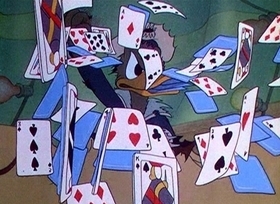 My favorite is how he curses Donald to have a deck of cards come spitting out of his mouth. It happens five times in the short, but that doesn’t make it lose any impact. 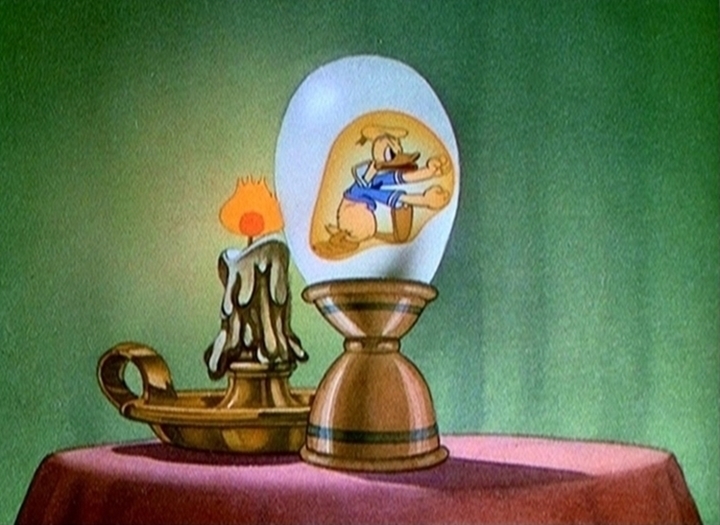 There’s also some classic transformations, as we get to see Donald changed into a kangaroo, fighting a cactus, and taking on Mickey directly. Again, this is the most involved Mickey has been in his own shorts in quite some time. It’s a welcome change, as he’s downright mean to Donald at times, but you still are rooting for him. I think some people read my comparison between Donald and George Costanza wrong yesterday, when I said that Donald was a “stupid jerk who gets what he deserves.” I really meant that more about George than Donald. Donald just reminds me of George, because he is all id – he does whatever he wants, and often gets what he deserves because of it. That’s not to say Donald isn’t a loveable character, quite the opposite. We love him because despite how hard we try to be the unflappable Mickey who ends up doing most things right, more of us are like Donald than we admit. That’s why it’s so great to see the two of them together in this short. Mickey is the one we all love and want to act like - on top of things, having some fun, in control. But Donald is who we are, for better or for worse.